Some drafts of Article 13 of the pending EU Copyright Directive no longer contain the word "filters" -- because the world's leading technical, legal and human rights experts all say these will lead to widespread censorship of legitimate, noninfringing materials. But it doesn't take a lot of work to understand that the Directive still mandates filters. In a nutshell, if you demand that, say, Youtube must vet all of the 300 hours of new video it receives every minute to ensure it doesn't infringe copyright, with massive penalties for letting even a single frame of infringing material through, there just isn't any other conceivable way to even approximate that, apart from filters. And of course, the proposal has been about filters from the start. The fact that the word "filter" has been removed from MEP Axel Voss's latest text doesn't change that -- nor do unconvincing phrases about avoiding filters or not clobbering legitimate materials. The entertainment corporations (and not regular users) have all the power in this system, and if platforms have to choose between risking the wrath of a kid whose school project was unfairly censored, or Universal or Disney, the kid is going to be out of luck. 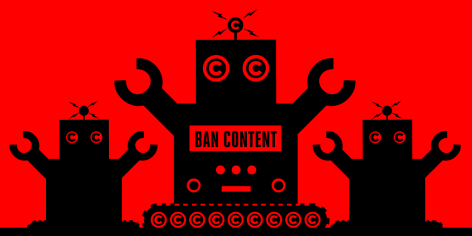 After many Twitter debates with apologists for Article 13, I've summarised and rebutted all their arguments in a post for EFF's Deeplinks: "Yes, the EU's New #CopyrightDirective is All About Filters." Some drafts of the Directive do say that EU nations should have "effective and expeditious complaints and redress mechanisms that are available to users" for "unjustified removals of their content. Any complaint filed under such mechanisms shall be processed without undue delay and be subject to human review. Right holders shall reasonably justify their decisions to avoid arbitrary dismissal of complaints." What's more, "Member States shall also ensure that users have access to an independent body for the resolution of disputes as well as to a court or another relevant judicial authority to assert the use of an exception or limitation to copyright rules." On their face, these look like very good news! But again, it's hard (impossible) to see how these could work at Internet scale. One of EFF’s clients had to spend ten years in court when a major record label insisted — after human review, albeit a cursory one-- that the few seconds' worth of tinny background music in a video of her toddler dancing in her kitchen infringed copyright. But with Article 13's filters, there are no humans in the loop: the filters will result in millions of takedowns, and each one of these will have to receive an "expeditious" review. Once again, we're back to hiring all the lawyers now alive -- or possibly, all the lawyers that have ever lived and ever will live -- to check the judgments of an unaccountable black box descended from a system that thinks that birdsong and silence are copyright infringements. It's pretty clear the Directive's authors are not thinking this stuff through. For example, some proposals include privacy rules: "the cooperation shall not lead to any identification of individual users nor the processing of their personal data." Which is great: but how are you supposed to prove that you created the copyrighted work you just posted without disclosing your identity? This could not be more nonsensical if it said, "All tables should weigh at least five tonnes and also be easy to lift with one hand."